Just as tuna is the chicken of the sea, dogs are the sharks of the land. Our fuzzy companions can weigh over 200lbs and are packed with a mouth full of teeth and jaws strong enough to crush bone… They’re cute and cuddly, but you don’t want to end up being their next doggy toy. I WILL talk about surviving a dog attack, but first I think it’s helpful to understand how a dog is trained for protection. Not only will this give you insight into surviving an attack, but it just might get you to train your own dog… something I highly recommend. You see, at least with the police I trained dogs with for 3 years when I was a high-schooler, there was a saying that was considered a truism: A trained attack dog is much safer than an untrained ‘pet’. First, because a ‘protection’ dog has been taught to recognize agression… they can pick an agressive attacker out of a crowd and single them out for their furry… uh… fury. Second, unlike untrained dogs, a well trained dog can be called off in the blink of an eye. 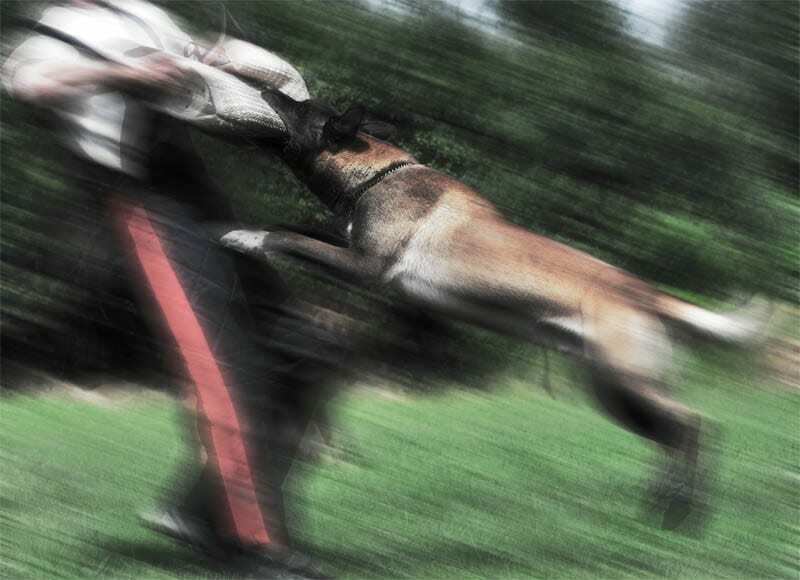 As a matter of fact, one of the final tests my own dog had to pass before she ‘graduated’ was protecting me against multiple attackers, and then being called off in mid-air as she launched herself at a fleeing attacker who stood still. (for legal reasons, police dogs are not supposed to attack once the person stops moving). Stopping an attacking dog in mid air is some SERIOUS jedi dog control. Meanwhile, an untrained dog who is attacking someone is likely to bite its owner and anyone else who tries to pull it away. So, remember: if you train your dog as a protection dog, it will be SAFER for you, your family, your neighborhood. Well, contrary to popular opinion, you don’t have to make a dog ‘mean’ to make it a great protection dog. It’s all about tapping into the dog’s natural instincts while it’s a puppy. Initially you have someone take a burlap sack and walk up ‘sneaky-like’ to you and your pup… While they walk up, you say your “watch” word… This is any word that you will later use to ‘alert’ your dog that there may be a problem. Once your pup takes the burlap sack, you say your next command… which is the “bite” word… and pet them while they ravage the sack. Your attacker plays tug-of-war with him/her a bit, and then let them “win” the sack as their prize. At this point, you praise the pup immensely, telling them how great they are, and generally acting as if your puppy has just single-pawedly solved world hunger. You then give the “release” command, and grip the pups cheecks with your thumb and fore-finger, lightly pinching their cheeks against their teeth. This triggers an automatic “release” reflex, so you are now anchoring your release command with the action of releasing the ‘prize’. Finally you praise your pup some more, and then the process is repeated. Over time, as your pup sees this repeated, they will perk their ears up and look around anxiously for the “attacker” (aka playmate) when you say your “watch” word. They will learn to hold tight as you repeat the “bite” word, and they will release the attacker when you say your “release” word. It’s important to remember that your dog is hard-wired to want to please you. More than almost anything in the world, that is what a dog wants. But without establishing proper communication, your dog has no idea in hell what you want. The key is repetition and consistency. As your pup gets older and progresses, the burlap sack turns into a burlap sleeve, which is still dragged on the ground and played with the dog, who does the same “grab, attack, struggle, release” routine that they did with the sack. Next, once they are hitting the sleeve consistently, your attacker puts the sleeve on their arm and taunts the pup with the sleeve… This is where the transition is made from playing with a sack to biting a person’s arm… All the same commands and techniques are used, but now the sack-turned-sleeve has an arm stuffed in it. The final phase is to take your dog off it’s leash and rather than have the attacker go after your dog, you put your dog in a down-stay, walk out to talk with the attacker, and they attack YOU. At this moment, all the ‘play’ attacking comes together with your dogs natural inclination to protect you, and like clockwork your dog will protect you from your attacker. There are few things more incredible than having your best buddy launch themself into harms way to try and protect your life. It’s an incredibly bonding experience with your dog, and something that could save your life or the lives of others. Please tell me how to ” untrain” a dog that has been taught to attack in order to protect property ( drugs etc) ? That’s a hard thing… a dog trained to attack “in general” is a dog who has had their character molded in a way that is hard to undo. It will take a lot of socialization and patience, and in reality, I’d never fully trust such a dog to be “safe” around kids, etc. This is why it’s important to train them to recognize aggression, not to just make a mean dog. Wow… This is really interesting. I never heard anyone break down how they train these dogs. Makes a lot of sense. I always assumed they brutalized them and made them mean. Cool that they use the dogs natural instincts!